The Geosynchronous Satellite Launch Vehicle Mark III: also referred to as the Launch Vehicle Mark 3, LVM3 or GSLV-III)is a launch vehicle developed by the Indian Space Research Organisation (ISRO). It is intended to launch satellites into geostationary orbit and as a launcher for an Indian crew vehicle. 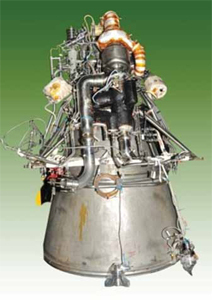 The GSLV-III features an Indian cryogenic third stage and a higher payload capacity than the current GSLV. 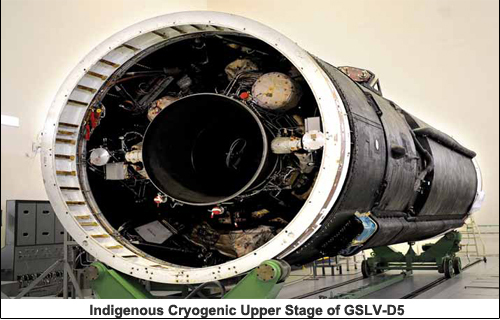 Definition: A cryogenic engine/ cryogenic stage is the last stage of space launch vehicles which makes use of Cryogenics. Cryogenics is the study of the production and behaviour of materials at extremely low temperatures (below -150 degree Centigrade) to lift and place the heavier objects in space. Description: Cryogenic stage is technically a much more complexed system with respect to solid or liquid propellant (stored on earth) stages due to the usage of propellants at extremely low temperatures. A cryogenic engine provides more force with each kilogram of cryogenic propellant it uses compared to other propellants, such as solid and liquid propellant rocket engines and is more efficient. Cryogenic engine makes use of Liquid Oxygen (LOX) and Liquid Hydrogen (LH2) as propellants which liquefy at -183 deg C and -253 deg C respectively. LOX and LH2 are stored in their respective tanks. From there they are pumped in to turbo pump by individual booster pumps to ensure a high flow rate of propellants inside the combustion/thrust chamber. The major components of a cryogenic rocket engine are combustion/thrust chamber, igniter, fuel injector, fuel cryo pumps, oxidizer cryo pumps, gas turbine, cryo valves, regulators, the fuel tanks and a rocket engine nozzle.